Chances are that someone you know and care about has diabetes. Diabetes is common in the US, but despite high rates, there is still plenty of public confusion about the two main types of this disease. The American Diabetes Association (ADA) estimates that 25.8 million Americans have diabetes, which causes high blood sugar (glucose) levels. 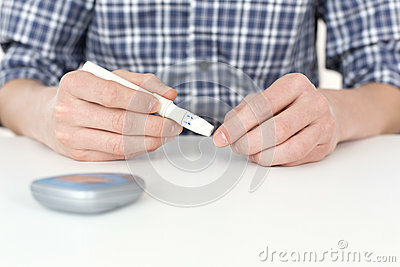 Around 5 percent of diabetes patients have type 1 diabetes and around 90 to 95 percent have type 2. So how do the two forms of diabetes differ, and what can be done in the face of the condition? According to ADA, in type 1 diabetes, the body does not produce insulin, a hormone that is used to process sugar into energy. In type 2 diabetes, however, the body does not use insulin properly — a situation known as insulin resistance. "At first, your pancreas makes extra insulin to make up for it," the ADA says of insulin resistance. "But, over time it isn't able to keep up and can't make enough insulin to keep your blood glucose at normal levels." According to the Mayo Clinic, complications of both type 1 and type 2 diabetes can include heart and blood vessel disease, nerve damage, kidney damage and eye problems. Keeping blood sugar levels under control helps reduce the risk of these complications. According to the Centers for Disease Control and Prevention (CDC), there is still a lot to be learned about exactly how each form of diabetes develops, and genetics seem to play a role in both. However, the causes of type 1 and type 2 seem to be different, and the risk for type 2 is more influenced by lifestyle factors, such as obesity and inactivity. "The appearance of type 1 diabetes is suspected to follow exposure to an 'environmental trigger,' such as an unidentified virus, stimulating an immune attack against the beta cells of the pancreas (that produce insulin) in some genetically predisposed people," CDC explains. Children and young adults are the predominate group of patients diagnosed with type 1 diabetes, so much so that it used to be called juvenile diabetes. According to ADA, only around 5 percent of diabetes patients have type 1. "Risk factors are less well defined for type 1 diabetes than for type 2 diabetes, but autoimmune, genetic, and environmental factors are involved in developing this type of diabetes," explains CDC. For type 2 diabetes, formerly called adult-onset diabetes, risk factors include obesity, family history, physical inactivity and older age. CDC noted that some ethnic groups, including African Americans, Hispanic/Latino Americans and American Indians, have a higher risk for developing type 2 diabetes. According to the Mayo Clinic, treatment plans for both forms of diabetes include healthy eating, regular physical activity, and the close monitoring of blood glucose levels. Managing either form of the condition requires a lifelong commitment, says the Mayo Clinic. For type 1, treatment also usually involves insulin therapy, or injections of insulin, since the body does not produce the hormone on its own. For type 2 diabetes, some patients may also use insulin therapy and some may use oral diabetes medications, or a combination of both, to treat the condition. "People with diabetes must take responsibility for their day-to-day care, and keep blood glucose levels from going too low or too high," CDC explains. "People with diabetes should see a health care provider who will monitor their diabetes control and help them learn to manage their diabetes." In an interview with dailyRx News, Dr. Barry Sears, President of the non-profit Inflammation Research Foundation in Marblehead, MA and creator of The Zone Diet, said there are steps that can help prevent both forms of diabetes. "It has been shown that administering cod liver oil in the first year of birth decreased the risk of developing type 1 diabetes by 25 percent," said Dr. Sears. "This benefit of cod liver oil was only due to the omega-3 fatty acids, not the vitamin D.
"You also induce type 1 diabetes in animals by giving them injections of streptozotocin (STZ). In such animals, if you increase the omega-3 fatty acids, the animals are protected," explained Dr. Sears. "The current intake of omega-3 fatty acids is about 113 milligrams (mg) per day for adults, which is far below my recommendation of a minimum of 2.5 grams per day." Dr. Sears noted that a tablespoon of cod liver oil would supply 2.5 grams of the essential fatty acids EPA and DHA per day. "For a young child, I would recommend at least 500 mg of EPA and DHA for the first six months of life, followed by 1 gram per day from ages 6 months to 2 years, and then 2.5 grams per day thereafter," said Dr. Sears. "I should point out it is a national mandate in Norway that children should be given 700 mg of EPA and DHA per day within 7 days of birth." In terms of preventing type 2 diabetes, Dr. Sears suggested that people examine their diets. "Type 2 diabetes is diet-induced," explained Dr. Sears. "The dietary recommendations in The Zone to reduce inflammation were a low-calorie diet consisting of 40 percent low-glycemic carbohydrates, 30 percent low-fat protein, and 30 percent fat rich in monounsaturated fats. A decade later, those were essentially the same recommendations of the Joslin Diabetes Research Center," Dr. Sears said. "My next book, The Mediterranean Zone, takes those recommendations to a new higher level," said Dr. Sears. "In essence, eat a lot of colorful vegetables (two thirds of the plate) with one third of the plate consisting of low-fat protein at every meal and use of dash of extra virgin oil for added fat. "Add extra EPA and DHA as a supplement and you have a winning dietary formulation to manage existing type 2 diabetes and more importantly, a dietary pathway to prevent it in the first place," Dr. Sears told dailyRx News.